Last update noted the market may be in position for a correction, and expected some downside follow-through beneath Wednesday's low. We did see a little downside follow-through, but as I highlighted yesterday, 1514 was the key level to watch as the break-point catalyst for any larger correction. 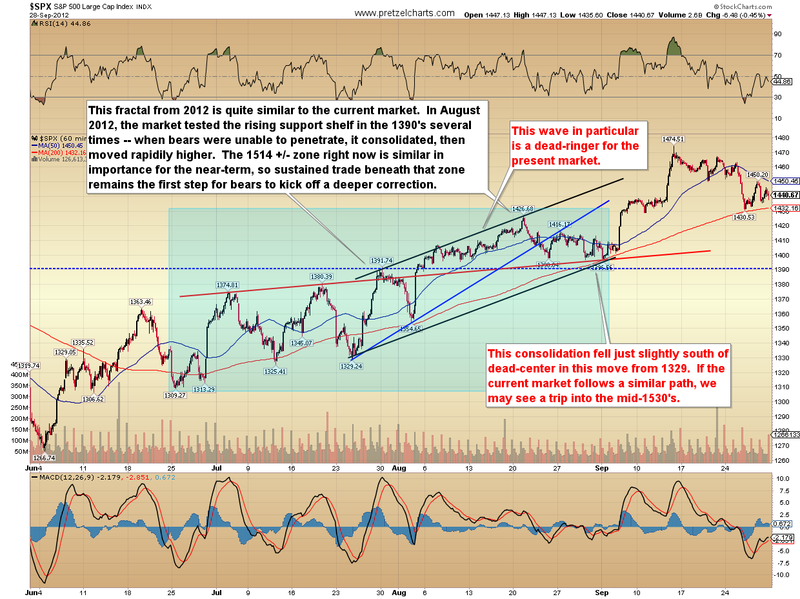 The market bounced at 1514.02, and has thus left its options open. I believe it's very important to assimilate new information as quickly as possible as a trader. The fact that the market bounced at the key 1514 level is new information I didn't have yesterday, and the market's reaction must be respected. 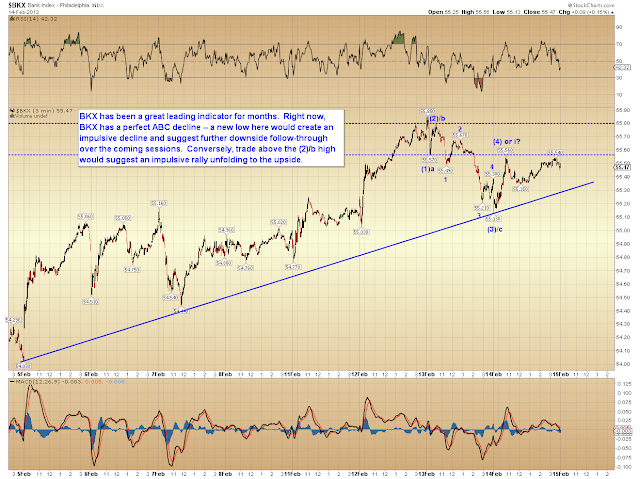 Today we'll find out how the market reacts to the prior high, which is now the key upside level. I do want to emphasize here that I continue to believe the intermediate trend is up, so top-hunting is a dangerous game right now. I spent a lot of time on charts tonight, trying to unlock exactly where we are in the micro and macro pictures, and the conclusion I've come to is that if the market sustains trade above 1525, it's probably time for me to put my quick foray into top-hunting on the back burner again until the next clear signal. 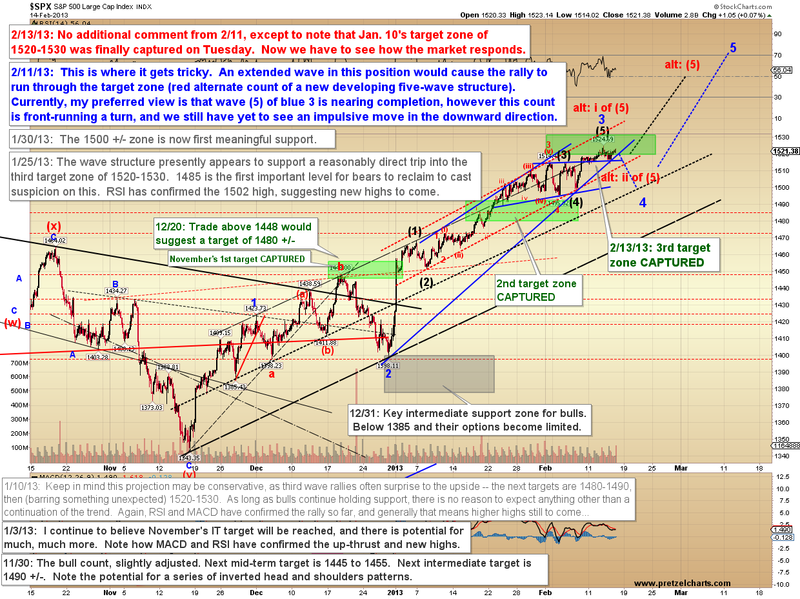 Could there be one more little wave up to 1534? Sure there could, but there could just as easily be "one more little wave up" to 1600. As I've mentioned like a broken record almost every day since 2013 began: this is a third wave rally at several degrees, and that means this is as strong a trend as one is likely to ever see. So... let's not get too hung up playing the top-hunting game. It's fine to take quick stabs at inflection points (like now), but I would strongly suggest not getting married to any bearish positions just yet. Since we can't take both sides of the trade, one could just as easily end up chasing back into longs and regretting ever having sold in the first place. 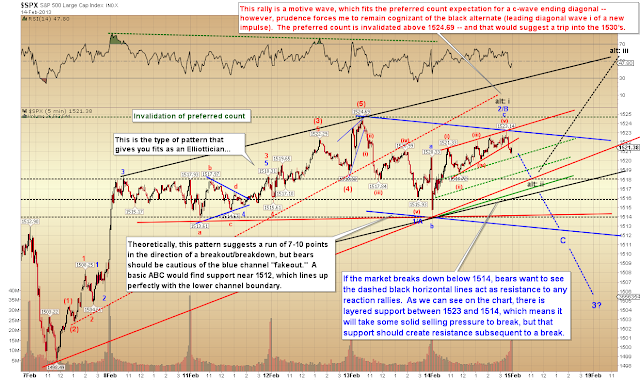 Third waves can be extremely unkind to counter-trend trading. One of the charts I spent a lot of time with was the five-minute S&P 500 (SPX), which I then broke down again on the one-minute chart (not shown). I'm content that my intial hourly chart read was correct, and that either wave (5) of blue 3 has completed/nearly completed, or we are only seeing wave i of black (5) of blue 3. That means if the market doesn't put in a good reversal here in blue 4, we could have a lot farther to run before the next inflection point. Let's look at the hourly chart first to get our bearings. Note the red alternate count: a new developing five-wave structure could still see some short-term downside action, but would be devastating to bears over the intermediate term. Now let's zoom in on the five minute chart. I am still inclined to believe that further downside follow-though awaits over the near-term, but via the alternate count, we can see there is immediate potential danger for bears here, particularly if 1524.69 is knocked out. 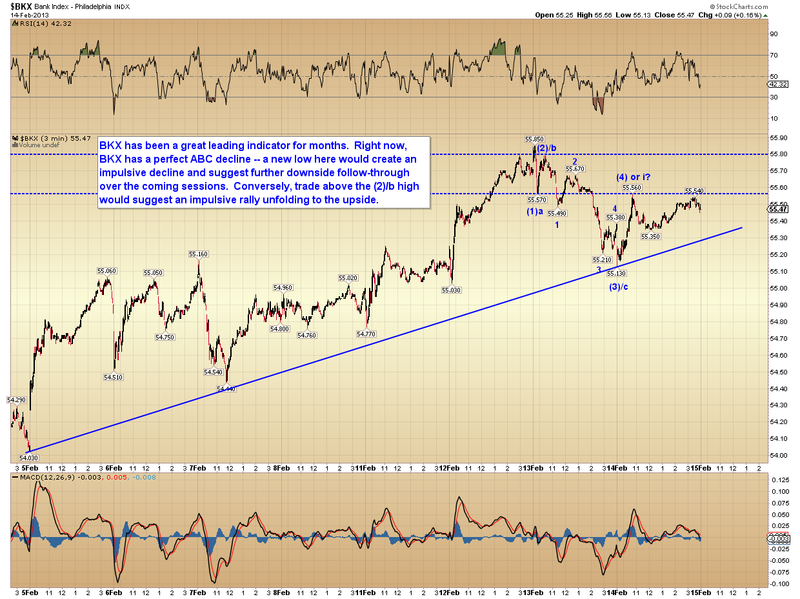 Given the present position of the market, targets are ambiguous at best -- however, this chart outlines a number of levels to watch which should help roadmap the next few sessions. As I studied the charts over the last couple nights, I kept thinking, "I've seen this wave before." Along those lines, I'd like to share a (or "an" if you don't pronounce your h's) historical fractal of a very similar past wave form. 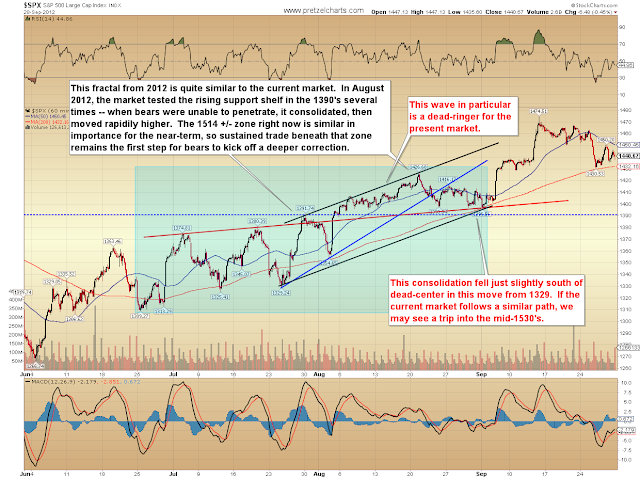 Note how similar the present wave is to the wave which formed into August of last year. This serves as another warning for bears if the support shelf at 1514 remains unbroken. This fractal, of course, does not tell us if support will continue to hold in the here and now -- but so far it has, so this does give us an idea of what we might expect if that remains the case. Finally, I'd also like to examine the Philadelphia Bank Index (BKX), which has been one of my market tells over the past several months. BKX has a perfect ABC corrective decline right now, however, the reaction rally has not reclaimed the blue (1)/a low (or the (2)/b high, obviously), which leaves options open in both directions for the moment. BKX absolutely needs a new low to make a five-wave impulsive decline, which would indicate the near-term trend had shifted. No new low would mean the trend at every degree remains pointed up. 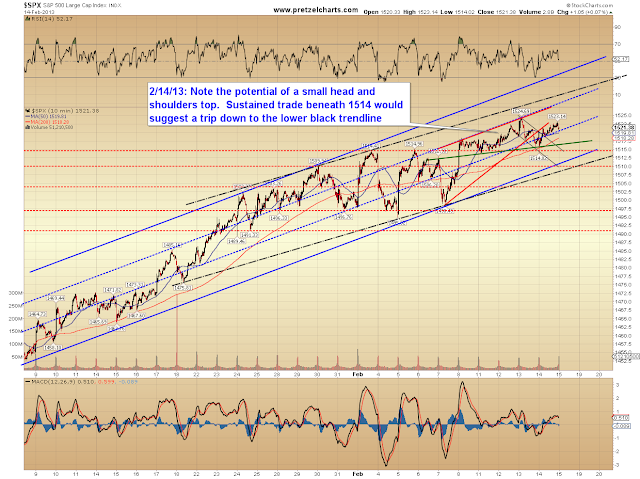 The blue trendline should be early warning.